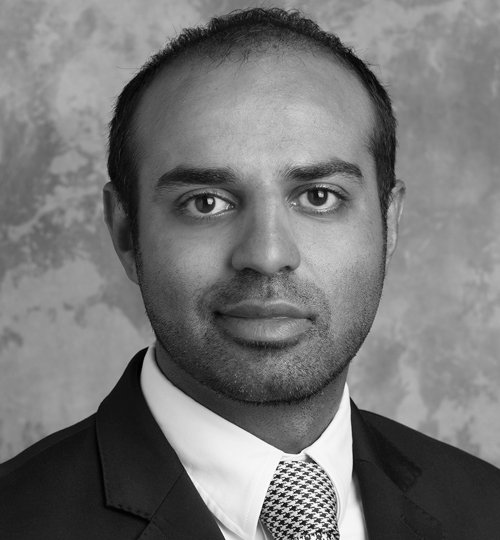 Masood Anjom focuses his practice on intellectual property and patent work including patent preparation and prosecution as well as patent litigation and technology contracts. He has represented plaintiffs and defendants in patent infringement suits before U.S. District Courts and the International Trade Commission and has worked on different phases of patent litigation from initial fact investigation to discovery and trial. He has also prosecuted numerous patent applications (both U.S. and International) relating to various technologies including, for example, oil field applications (e.g., drilling technology, logging technology, and other aspects relating to exploration and production of oil and gas) and computer hardware and software. Additionally, he has counseled clients regarding IP related agreement and IP clearance as well as IP due diligence associated with corporate mergers and acquisitions. He has also served as lead counsel in multiple post grant proceedings before the USPTO. While obtaining his electrical engineering degree he worked in the nanotechnology lab at the Cullen College of Engineering of the University of Houston. 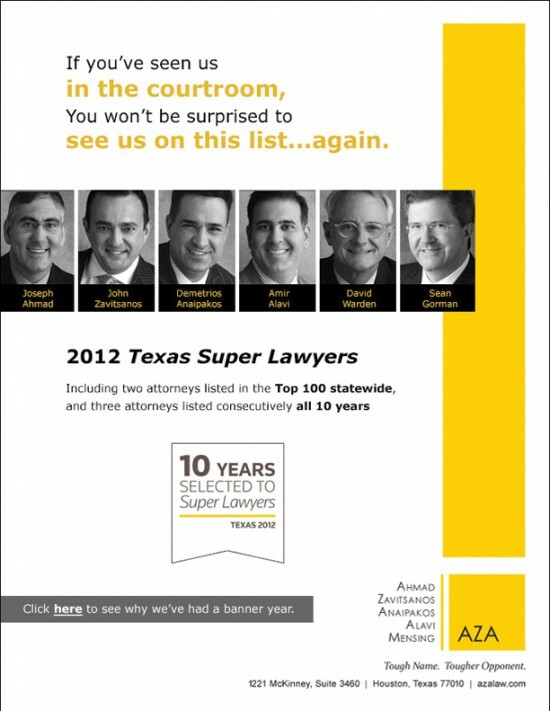 Mr. Anjom was previously a lawyer at Baker Botts L.L.P’s Houston office. He also was a volunteer prosecutor for the City of Houston where he handled a number of jury trials. TechnipFMC PLC v. Mukherjee et al. — Represented plaintiff in a trade secrets misappropriation and breach of fiduciary duty case involving a former executive. Case settled favorably for client the day before trial. St. Lawrence Communications, LLC v. Apple (E.D. Tex. – 2:16-cv-00082) — Represented plaintiff St. Lawrence Communications LLC in patent infringement case against Apple. The asserted patents related to high definition speech codec technology in smartphones. Case settled favorably for client before trial. St. Lawrence Communications, LLC v. Motorola Mobility (E.D. Texas – 2:15-cv-00351) — Represented plaintiff St. Lawrence Communications LLC in Eastern District of Texas patent infringement case against Motorola. Jury awarded more than $9 million and a willful infringement finding. Saint Lawrence Communications, LLC v. ZTE Corporation, et al. (E.D. Tex., 2:15-cv-00349) — Represented plaintiff St. Lawrence Communications LLC in patent infringement case against ZTE. The asserted patents related to high definition speech codec technology in smartphones. Case settled favorably for client before trial. St. Lawrence Communications, LLC v. HTC (E.D. Tex., 2:15-cv-00919) — Represented plaintiff St. Lawrence Communications LLC in patent infringement case against HTC. The asserted patents related to high definition speech codec technology in smartphones. Case settled favorably for client before trial. Saint Lawrence Communications LLC v. LG Electronics, Inc., et al. (E.D. Tex., 2:14-cv-01055) — Represented plaintiff St. Lawrence Communications LLC in patent infringement case against LG. The asserted patents related to high definition speech codec technology in smartphones. Case settled favorably for client before trial. Parthenon Unified Memory Architecture LLC v. ZTE Corporation, et al. (E.D. Tex., 2:15-cv-00225) – Represented plaintiff against cell phone manufacturer in a patent infringement suit related to patents directed to memory architecture. Case settled favorably for client before trial. Parthenon Unified Memory Architecture LLC v. Apple, Inc. (E.D. Tex., 2:15-cv-00621) — Represented plaintiff against cell phone manufacturer in a patent infringement suit related to patents directed to memory architecture. Case settled favorably for client before trial. Parthenon Unified Memory Architecture LLC v. Samsung Electronics Co., Ltd., et al. (E.D. Tex., 2:14-cv-00902) — Represented plaintiff against cell phone manufacturer in a patent infringement suit related to patents directed to memory architecture. Case settled favorably for client before trial. Parthenon Unified Memory Architecture LLC v. HTC Corporation, et al. (E.D. Tex., 2:14-cv-00690) — Represented plaintiff against cell phone manufacturer in a patent infringement suit related to patents directed to memory architecture. Parthenon Unified Memory Architecture LLC v. LG Electronics, Inc., et al. (E.D. Tex., 2:14-cv-00691) — Represented plaintiff against cell phone manufacturer in a patent infringement suit related to patents directed to memory architecture. Case settled favorably for client before trial. Super Interconnect Technologies LLC v. Samsung Electronics Co., Ltd., et al. (E.D. Tex., 2:15-cv-00773) — Represented plaintiff against cell phone manufacturer in a patent infringement suit related to patents directed to signal processing and transmission. Case settled favorably for client before trial. Loramax LLC v HEB Grocery Company, LP (E.D. Tex., 2:15-cv-00754) – Represented defendant HEB in a patent infringement case related to patents directed to data transmission in a multicomputer network system. Data Carriers, LLC v. Plains All American Pipeline, LP (E.D. Tex., 2:15-cv-01021) – Represented defendant Plains in a patent infringement suit related to data processing and display. SRI International, Inc. v. Dell Inc., et al. (D. Del., 1:13-cv-00737) – Represented defendant Dell in a patent infringement lawsuit related to network surveillance technology. VideoSqope, LLC v. IT Concepts, LLC (E.D. Tex, 6:15-cv-00544) – Represented defendant in a patent infringement lawsuit related to camera technology. SoftView LLC v. Huawei Technologies Co. Ltd., et al. (D. Del., 1:12-cv-00985) — Represented worldwide telecommunications company in defense of patent infringement allegations relating to mobile web browser technologies. IPR 2015-01494 — Successfully represented patent owner as lead counsel in Inter Partes Review of a patent relating to computer architecture technology before the Patent Trial and Appeal Board where institution was denied. IPR2015-01503 — Successfully represented patent owner as lead counsel in Inter Partes Review of a patent relating to computer architecture technology before the Patent Trial and Appeal Board where institution was denied. Patent Reexamination 90/013,921 — U.S. Patent No. 6,795,805 — Successfully represented patent holder in ex parte reexamination proceedings instituted on a patent relating to periodicity enhancement in decoding speech signals with co-counsel. The patentability of all challenged claims was confirmed by the USPTO. Patent Reexamination 90/013,894 – U.S. Patent No. 6,807,524 — Successfully represented patent holder in ex parte reexamination proceedings instituted on a patent relating to the use of a perceptual weighting device for efficient coding of a speech signal with co-counsel. The patentability of all challenged claims was confirmed by the USPTO. IPR2017-01075 — Successfully defeated a request for Inter Partes Review of a patent relating to speech coding resulting in the Board’s refusal. Research Assistant – Worked with nanoelectronics and semiconductor fabrication group as part of a team responsible for construction of an ion beam assisted electron beam evaporation system. Assisted establishing the power system and connections for an Ion Implantation System.